Youth make up almost 1.2 billion of the world population and this number is expected to grow. As of 2016, at least one in four youth (aged 15–29) is affected by violence or armed conflict in some way. The way youth resilience manifests itself is highly dependent on their social, economic and political environments. When youth are empowered and provided opportunities for participation, they are most likely to capitalize on their resilience constructively. For this reason, youth are the world’s most important asset in peacebuilding. Per the Security Council Resolution 2250 (2015) on Youth, Peace and Security, as well as to the UN Global Counter-Terrorism Strategy, we recognize that increased investment in their success is a necessary step in preventing and countering violent extremism. 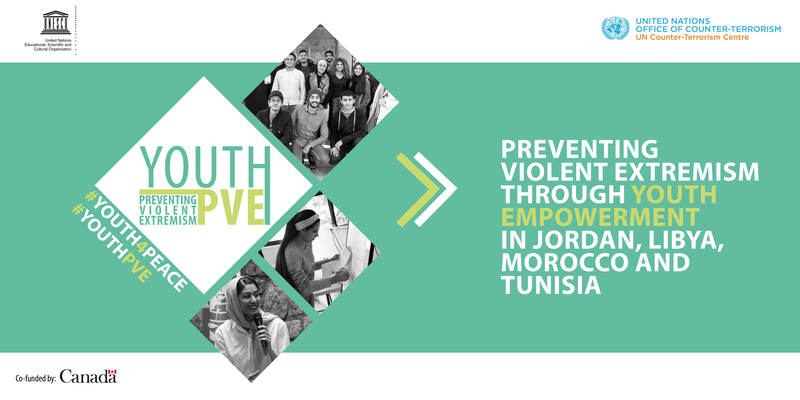 Through its new and innovative project “Prevention of Violent Extremism through Youth Empowerment in Jordan, Libya, Morocco and Tunisia”, UNESCO aims to create opportunities for young women and men to engage as change-makers and peacebuilders in their immediate communities and wider societies, and to promote a constructive vision of young people as leaders, addressing hate related issues. This UNESCO-UNCCT Project is co-funded by Canada.